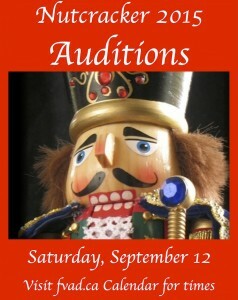 Nutcracker 2015 Auditions | Nutcracker Auditions Are Coming Soon! Nutcracker 2015 Auditions are open to all FVAD students. Students must be currently enrolled in Pre-Primary Ballet to Advanced 2 Ballet. Moreover, they must be attending all of the recommended ballet classes for their level. Audition times are listed below for each level. In addition, you can also view the times on the printable Nutcracker Auditions 2015. Students should dress for their ballet class level. They will have a short class with Mr Carney who will then determine casting over the following two weeks. Once casting is assigned, students are able to check the rehearsal schedule for their role(s) on the website Calendar. Performance fees are then due only if the commitment to rehearsal times can be met, and students accept their assigned role(s). Next Post: Summer Week 3 – A Very Eventful Week!